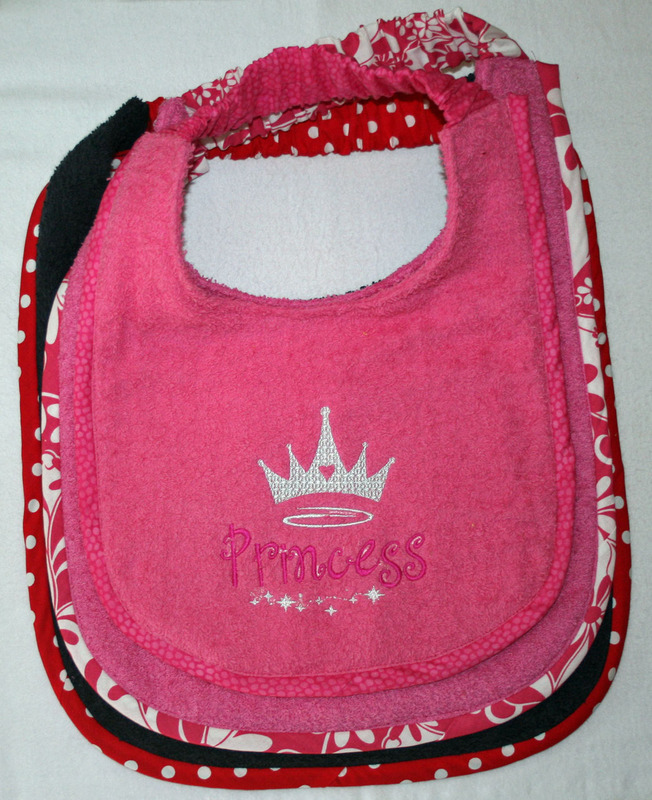 All Designs By 2Paws bibs are made in Paw Paw, Michigan, solely by me. Stock items are shipped immediately. Custom orders take up to 3 weeks to complete after payment is received. You will be notified via email of shipment details when order is shipped out. My bibs are constructed of two layers of 100% cotton terry cloth. Machine embroidery is done on the front layer so no stitching shows on the back side of the bib. I use the same color of terry cloth for the front and back of the bib unless requested to make it differently. Colors of the cotton fabric trim and elasticized neckband vary and will be selected based on the color of terry cloth and gender of the dog. All my drool bibs are machine washable in cold water and machine dry-able. They are made to last many years. My quality assurance team has been very thorough with their testing of my products. Large Size The large drool bib has a generous drool area of 11” long by 14” wide. The easy on and off elastic neckband will accommodate a 25-28 inch neck size. Minor adjustments to the neck strap can be made to fit the larger or smaller neck sizes. This is the most common size and fits most of the XXL breed dogs. Medium Size The medium drool bib has a generous drool area of 10” long by 13" wide. The easy on and off elastic neckband will accommodate a 22-25 inch neck size. Minor adjustments to the neck strap can be made to fit the larger or smaller neck sizes for this chest size. 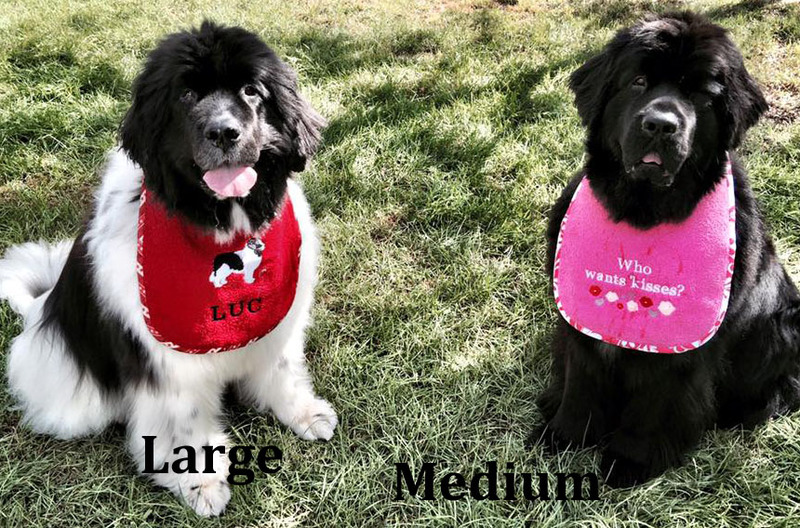 This size works very well for the smaller Newfoundlands, Bernese Mountain Dogs and some of the smaller Mastiff breeds. Puppy Size The puppy sized drool bib has a drool area of 8" long by 11" wide. The easy on and off elastic neckband will accommodate a 18-21 inch neck size. Minor adjustments to the neck strap can be made to fit the larger or smaller neck sizes. For most XXL breeds, the puppy size will last up to 12 months. This size will also fit the heavy drooling Labrador Retriever, Golden Retriever and Clumber Spaniel with some minor neck strap adjustments. Super-Size This size was requested by a customer for their show dog to wear while resting between show ring times. It was designed to keep the chest and leg fronts dry and free from drool. I thought this was such a good idea, I decided to carry it as a regular item on my web site. The bib is approximately 22 inches long. The drool area is approximately 16” long by 16 ½” wide. The easy on and off elastic neckband will accommodate a 27–31 inch neck size. This size is unique for the show dog and not really appropriate for the normal usage of a drool bib.